Muhammadu Buhari promised to embrace democracy as president, but turned out to be the same autocrat who failed the country 30 years ago. it’s been a tough year for Nigerian President Muhammadu Buhari. The mood in Africa’s most populous nation is a far cry from the euphoria that greeted his historic 2015 election — the first time in Nigeria’s history that an opposition candidate unseated an incumbent president in a democratic election. For weeks and even months after the vote, Buhari was a media darling, praised at home and extoled abroad. Since then, the cheers have turned to jeers — even from members of the president’s own party, the All Progressives Congress (APC). Meanwhile, his administration cowers under attacks from a disillusioned electorate, members of the opposition, and even Buhari’s wife, Aisha, who said she might not vote for him in 2019, when he is up for re-election. What’s behind the swift unraveling of Buhari’s presidency? His inability to formulate a coherent economic plan as Nigeria tipped into recession and unwillingness to make crucial decisions — as basic as appointing a cabinet — in a timely manner certainly didn’t help. But the main reason Buhari has lost the support of his countrymen is that the last year has revealed the central premise of his candidacy to be false: The man who claimed in the campaign to be a “reformed democrat” has proved to be the same old authoritarian showman who ruled Nigeria in the early 1980s. The man who claimed in the campaign to be a “reformed democrat” has proved to be the same old authoritarian showman who ruled Nigeria in the early 1980s. "The man who claimed in the campaign to be a “reformed democrat” has proved to be the same old authoritarian showman who ruled Nigeria in the early 1980s." Buhari’s first attempt to run Nigeria ended after a year and a half in the same manner it started: a coup d’état. Back then, Buhari launched a campaign to root out corruption, dubbed the “war against indiscipline,” which was accompanied by restrictions on free trade and free speech, as well as repression of his political opponents. Soon Nigeria was embroiled in a political and economic crisis that paved the way for his ouster. By 2015, however, many Nigerians were ready to give him a second chance. Growing economic hardship and rampant corruption — and the seeming inability of then-President Goodluck Jonathan to tackle either — convinced them to embrace Buhari again despite his checkered past. To many he seemed like a competent leader — at least more so than the weak and feckless Jonathan. But there is already a strong element of déjà vu in Buhari’s second stint at the helm. He has again staked his presidency on an anti-corruption crusade and again used it as a vehicle to target political opponents. Now, as before, Buhari’s legitimacy was built on empty showmanship, a hyped-up claim of superior morality and discipline coupled with a healthy dose of disdain for elitism, all quickly overshadowed by an economic crisis that he wasn’t equipped to tackle. Part of the problem this time is that he promised much more than he could ever have hoped to deliver. On the campaign trail, he pledged to create millions of new jobs and make Nigeria’s currency, the naira, “equal to the dollar,” two Donald Trump-worthy whoppers that were about as likely to materialize as a border wall paid for by Mexico. In any case, the results have been predictable. Instead of creating jobs, the Nigerian economy has shed half a million of them since Buhari took office, swelling the already bloated ranks of the unemployed to 13.3 percent. The current dollar exchange rate for the naira is about 455 to 1, compared with 260 to 1 around this time last year. Food prices have reportedly doubled across the country, forcing millions of people to go hungry as a famine looms in the north. Not all of this is Buhari’s doing, of course. He inherited an oil-dependent economy only to watch the price of crude crater. He also inherited an empty treasury, the result of past administrations’ unchecked venality and failure to save when oil prices were high. But Buhari’s actions, inactions, and posturing against free enterprise have helped make a bad situation worse. Despite spending the better part of the past decade campaigning for president, Buhari came into office with no idea who to appoint to his ministerial cabinet. Most presidential aspirants would have vetted potential appointees during their campaigns or at least during the transition. But Buhari didn’t name a cabinet until about six months into his presidency, blaming his inability to compose an economic management team on the fact that Nigerians were all “compromised.” During that time, capital projects like the building of major roads were stuck in limbo; protracted delays in approving the national budget also meant that federal ministries were unable to perform their basic functions. By the end of August, the economy had slipped into recession. Admitting he’s no economist, Buhari’s economic decisions have been eccentric. Despite all indicators pointing to the need to devalue the naira following the loss of oil revenue, Buhari has declined to do so, insisting on applying stringent controls on the foreign exchange market and the importing of commodities like rice and frozen chicken. Buhari seems to be betting on his administration’s ability to boost domestic production, even though the critical infrastructure needed to do so, like a stable power supply and functional roads, is not in place. The closest Buhari’s administration has come to articulating an economic plan is announcing its intention to borrow as much as $5 billion from foreign countries, including China and Japan. Meanwhile, disappointed investors are fleeing (or refusing to come) due to the unfavorable business climate. More than 250 companies have reportedly shut down in the past year alone. Buhari’s much-heralded anti-corruption crusade has also largely proved to be a charade. The administration has initiated several investigations into financial fraud or misappropriation by former government officials, but so far there have been no convictions. The president has refrained from going after his close associates, individuals like Bola Tinubu, a powerful figure within the ruling party who was once described as “corruption personified.” Instead, it has been opposition politicians and members of his predecessor’s administration that have been the focus of his anti-corruption efforts. Last month, he dispensed with due process altogether and ordered the state security service to arrest and raid the homes of judges who hadn’t been charged with a crime. 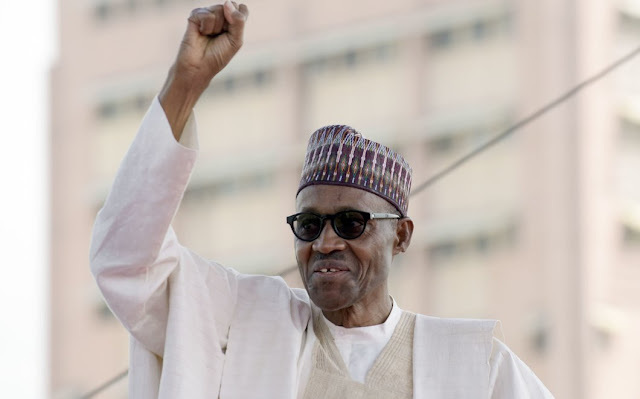 Buhari’s gradual turn toward authoritarianism has revealed the emptiness of his central campaign pitch: Far from embracing the democratic process, he has sought to unilaterally impose his will and whims on the country, even when it means subverting the rule of law. It is safe to say that Buhari’s misogynist remarks won’t bring his administration down or even diminish his popularity going forward. The truth is that many Nigerian men (and women) hold similar views. But if he wants to avoid a drubbing in the 2019 election, Buhari must put forward a realistic plan to fix the tattered economy while showing voters that he is indeed a “reformed democrat” and not the same old strongman they remember from the last time around.